It was there when man first walked on the moon. And when a president struck a blow to an iron curtain with a single speech. It was there when Scouts across the country rallied to provide relief in the wake of Hurricane Katrina. For over 106 years, it has been in the heart of every Scout who ever overcame one of life’s challenges. It is the value of being prepared. The core of Scouting and a statement that inspires a lifetime of character and service. As we look to a new century of Scouting achievements, we light a new fire in the next generation of Scouts. We shall instill in them the honor and integrity that comes with being a Scout. We will build their character and ensure they are prepared for something more. We will prepare them for life. Scouting builds character and community through a variety of activities including camping, canoeing, hiking, mountain biking, community service projects, and more. These hands-on activities instill a sense of confidence, preparedness and honor in our kids. 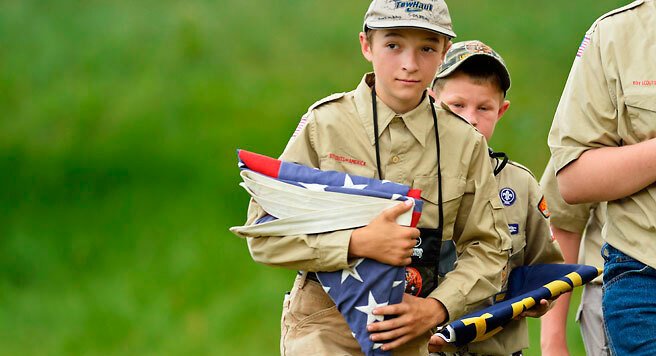 Contrary to popular belief, Scouting isn’t just for boys and young men. Scouting also offers venturing and exploring programs specifically geared to young women and men, ages 14-20. Founded on September 1, 1973, the Montana Council was the result of the merger of four councils (Western Montana, Yellowstone, North Central Montana and Vigilante Area Council. There are four Montana Council Camps (K-M Scout Ranch, Arcola, Melita Island and Grizzly Base). In addition, we operate the Montana Outdoor High Adventure Base (MOHAB) in partnership with the Boone and Crockett Club. The mission of the Montana Council is to help young people make ethical and moral decisions over their lifetimes by instilling in them the values of the Scout Oath and Scout Law.